To highlight snake-like scapes and crunchy sugar snap peas, I composed a raw and simple salad that allowed the produce to shine with little to no cooking, clean-up, or stress. Remove the stem end and string from each snap pea pod. If peas are too tough to eat raw, blanch for 30 seconds-to-2 minutes and submerge in an ice bath. In a food processor, pulse the scapes for 30 seconds. Add the pistachios and pulse again. Add the mint, lemon zest, lemon juice, and chili flakes. With the motor running, drizzle olive oil until pesto is smooth. In a bowl, toss sugar snap peas with 1 tbsp of pesto. Mix well and taste. Add another tbsp of pesto, if desired. Top with a sprinkle of black sesame seeds or gomaiso. Here is some produce eye candy supplied by Fresh Direct to help you get in the mood for fresh and flavorful summer bounty. 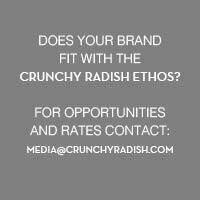 Fresh Direct is offering a $50 off limited-time offer just for Crunchy Radish Readers! This promo is good for first-time residential customers in the FreshDirect delivery areas. Enter code CRUNCHY at check out. Promo ends on 8/31/2015 and may not be combined with any other promotion code. Valid only for your first order. Valid only for orders totaling $125 or more before taxes.